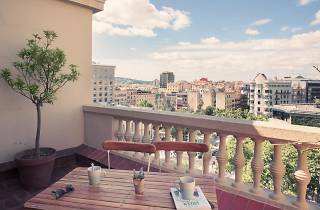 You don't have to max out your credit cards or take out a second mortgage to book a place to stay in Barcelona. 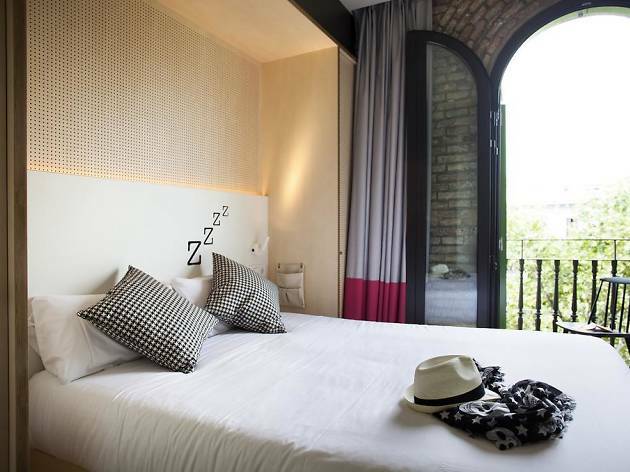 From designer hostels to small, charming hotels, the options for accommodations in the Catalan capital are many and varied. And even better is that you needn't trek out to the sticks to get a good deal, as most of these spots are in central neighbourhoods. 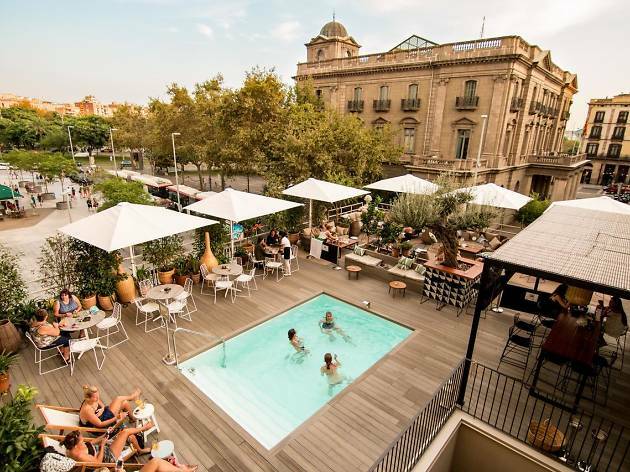 Have a look at our list of the best cheap hotels in Barcelona and save your euros for discovering all the things to do among this city's best of culture, entertainment and gastronomy. 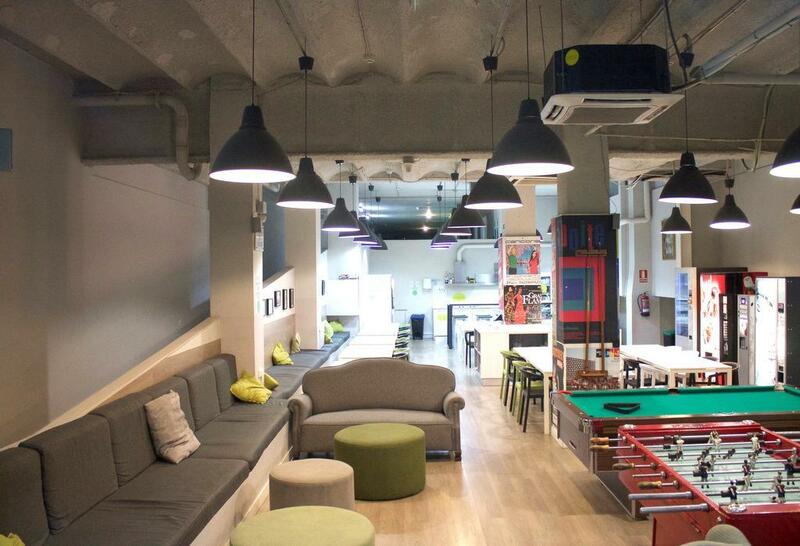 As far as hostels go, this one is pretty darn cool. 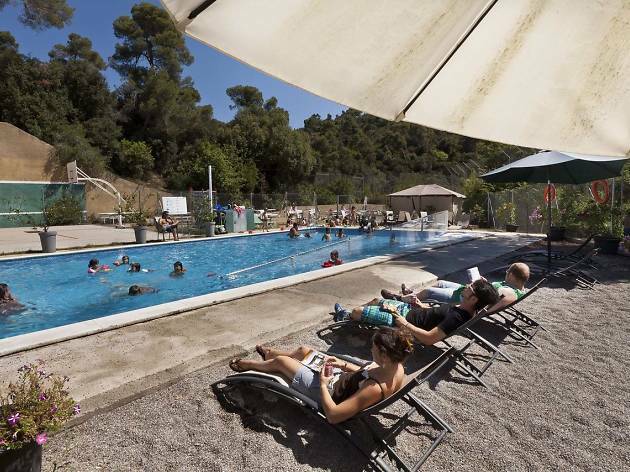 Inout is set in the mountainous Collserola Natural Park, tucked between the trees and offering great views, food and a pool. 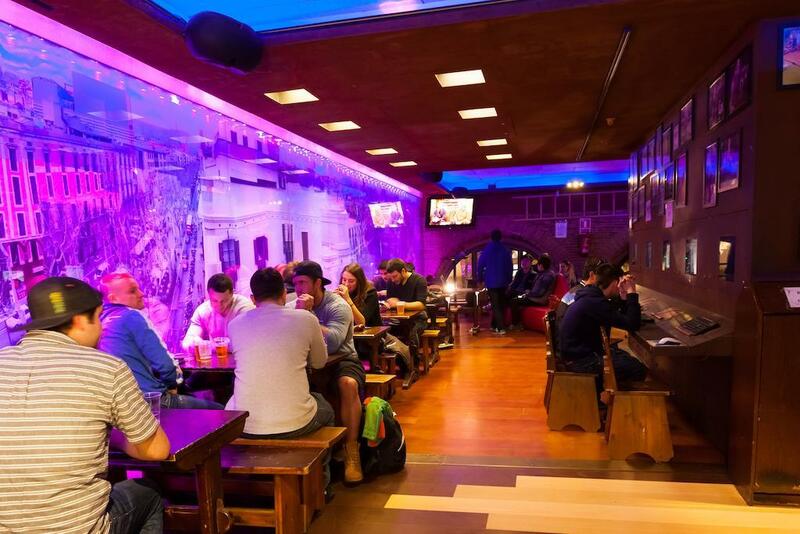 The extremely affordable restaurant, which serves traditional Spanish cuisine, sprawls from inside to out (as you’d expect given the name), with the communal lounge area following the same vibe. Elsewhere amidst the 59 acres is a basketball and tennis court, football, a TV room and kitchenette. The bathrooms (private and shared) are clean and simple, like the rooms, which contain bunks. When you’re ready to explore, it’s 30 minutes into Barcelona by train (including the walk to the station) or a similar by car (parking is free at the hostel). 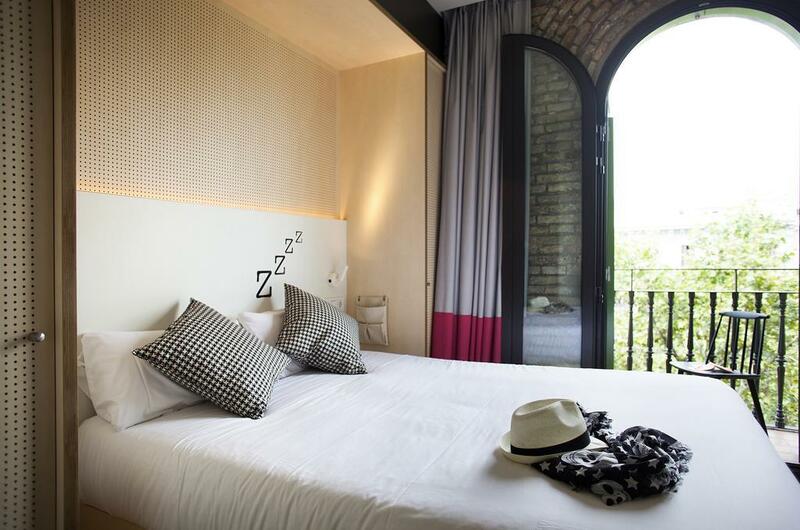 Stay in a 'luxury hostel' in the Eixample that's walking distance from top sights, including Gaudí's Sagrada Familia, La Pedrera and Casa Batlló when you stay at Yeah! Plus, who can resist such enthusiasm in a name? Choose a shared room, either with custom bunk beds or without, or a private suite – all rooms have their own, spacious, clean bathrooms. Beds in all the quiet rooms are modern and comfy, ensuring you can rest when you want to (though we can't speak to the noise level of your travelling companions). Common areas are bright and encourange fun and social interaction. You even have the option to join in organised activities like pub crawls and walking tours. 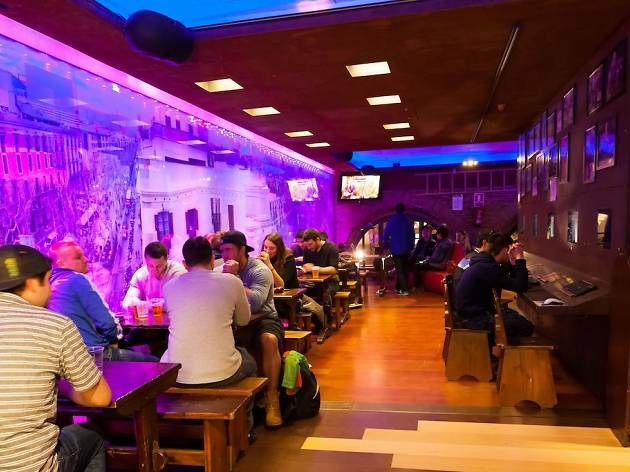 Kabul is pretty well established as a youth hostel, and since it changed its name slightly from 'Backpackers Hostel' to 'Party Hostel', you know immediately if this is your ideal cheap accommodation in Barcelona or if you should run far, far away. 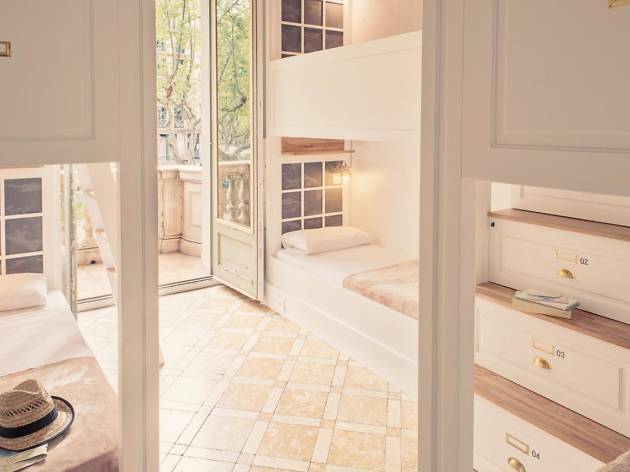 With prime real estate smack in central Plaça Reial, you're just a few steps away from La Rambla, where you'll also find two nearby metro stops to get you anywhere you want to go in the city. You'll sleep in dorm-style rooms that pack in as many bunk beds as a scene out of 'Orange Is the New Black', but guests love the relatively new addition of around-the-bed curtains, giving some semblance of privacy when you sleep. Kabul's 24-hour reception doubles as a bar during certain hours of the day and night, and when the weather is fine, most guests will be drinking their beers out of plastic cups up on the rooftop terrace. There's also basic breakfast and dinner included, a games room and a laundry room, making sure all your needs are fulfilled. 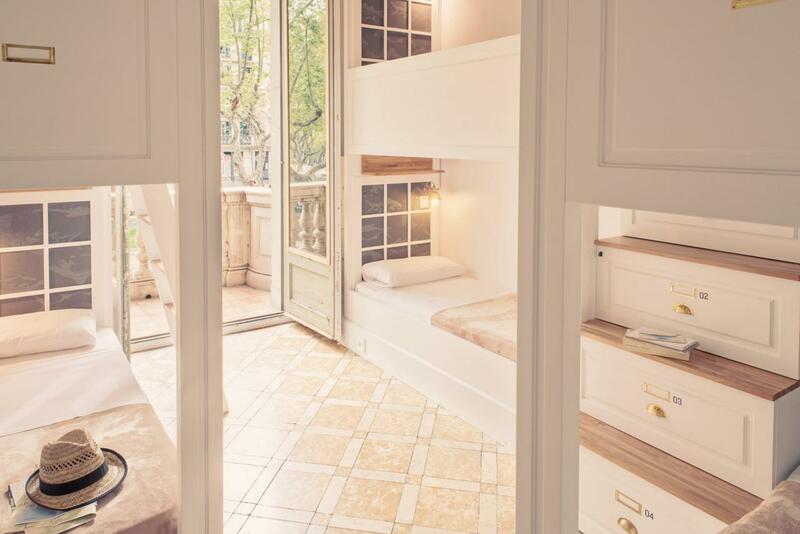 This 'boutique hostel' is a short walk from Plaça Catalunya, and it's one of the most eye-catching cheap accommodations you'll find in the city centre. It's a modern, elegant space with all the creature comforts that also offers private rooms. 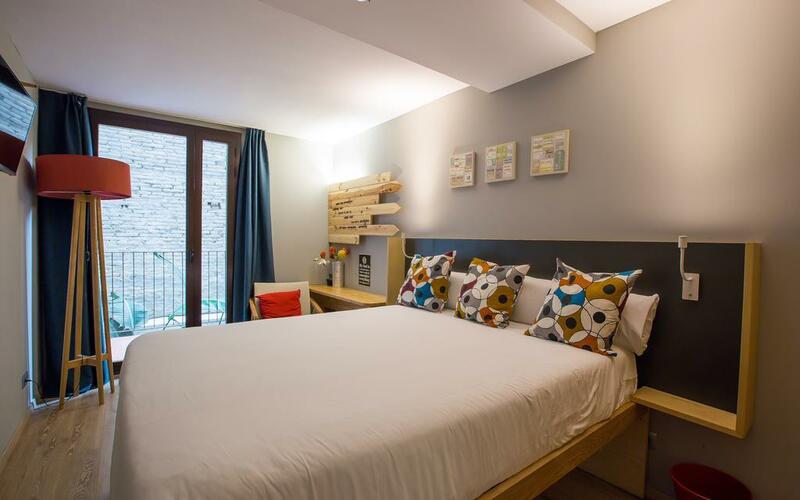 With designer furniture, parquet floors and light colours, what you've got is a very cosy hostel indeed. Bunk rooms sleep six or eight, and there are female-only rooms available. Suites for four have a queen bed and two bunks, and suites for two are kitted out with a queen bed. Play pool or board games, watch a film or live sports on the cinema screen, or head to the swimming pool for sun and splashing around in the warmer months. There's a daily happy hour in the bar, and Toc staff can even get you food 24/7 if you find your stomach growling between meals. 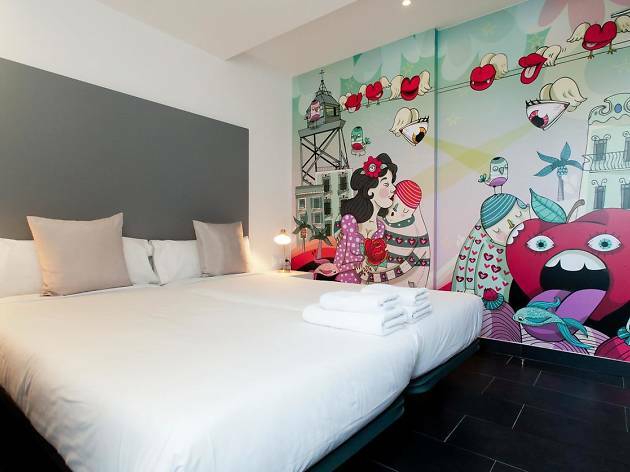 You can thank renowned designer Jaime Beristain for the look of this fun and fresh hotel, where each of the eight floors has a different theme in its hallway murals created by nationally and internationally renowned illustrators and designers. 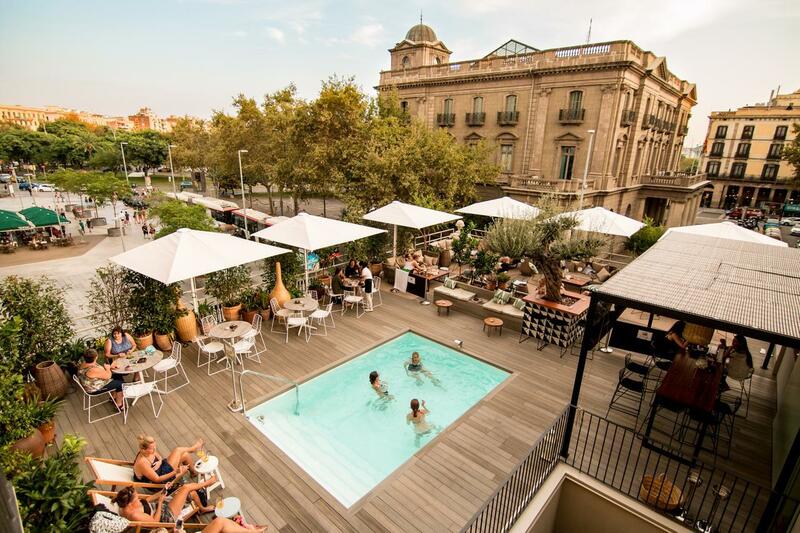 And go up one floor more to the terrace, where you'll find a plunge pool, perfect for those hot summer days in Barcelona. 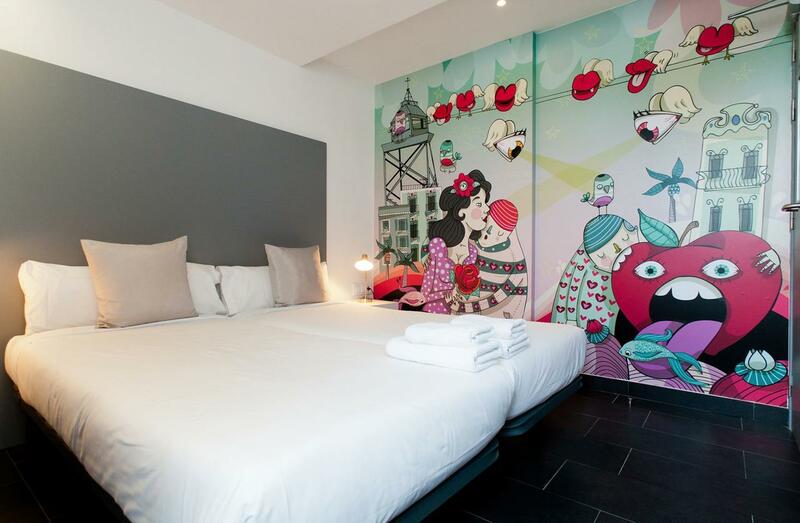 The mural theme suits the creative area of Poblenou where you'll be staying, especially with the area's graffiti corner nearby. 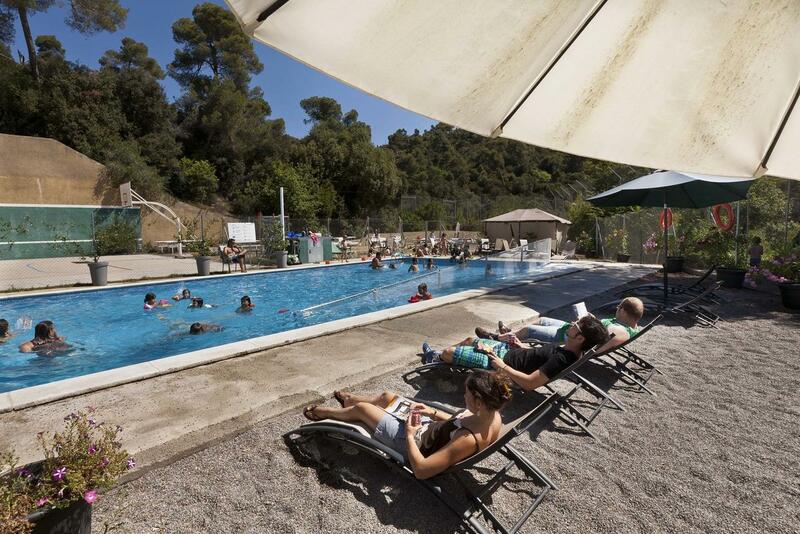 You're also a lovely stroll to the beach and really close to the Parc del Fòrum, which comes in handy if you're in town for one of Barcelona's big music festivals or other events that take place there throughout the year. 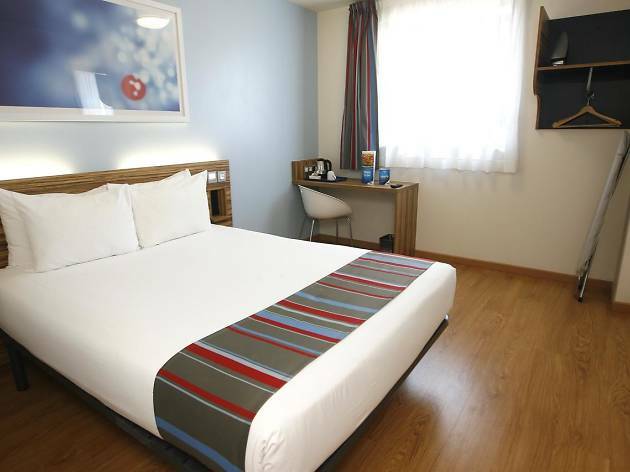 The Oasis is in a desirable location, walking distance to the Born neighbourhood and the rest of the city centre beyond, including La Rambla, and up to important modernista buildings on Passeig de Gràcia. Walk in the other direction and you're at the Ciutadella park or the beachside neighbourhood of Barceloneta with its bars and seafood restaurants, and the Mediterranean beyond. 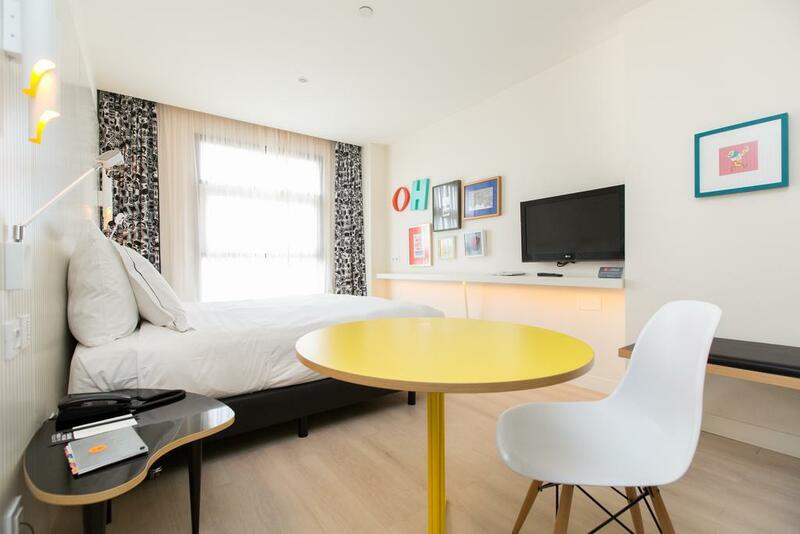 Choose your warm and cosy standard or superior room ­– with plenty of natural light and updated private bathrooms. Plus you'll really enjoy the seasonal terrace with a small swimming pool. Here's a modern hostel with both shared and private comfortable, light-filled rooms (some with balconies), as well as apartments. You also get a communal terrace, lounge, kitchen, dining area, and a 24-hour front desk, plus computers are available for guests' use. If you want to extend the group feel, sign up for the hostel's group events organised every evening, or one of their daily walking tours of the city. 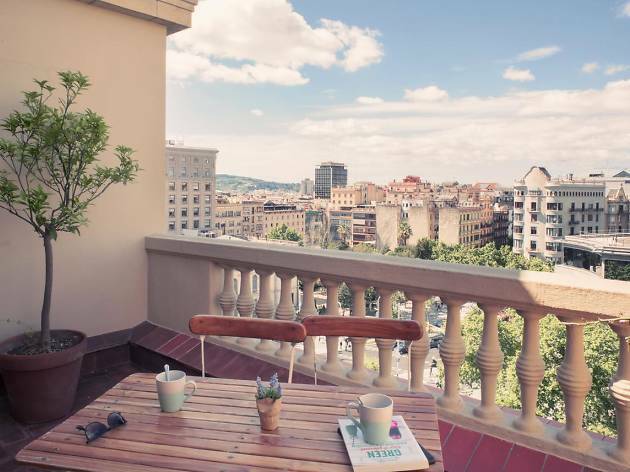 At the top of Passeig de Gràcia, your location affords you easy access to metro lines that will take you anywhere in Barcelona, and of course you can walk to top attractions, shops, restaurants and bars. 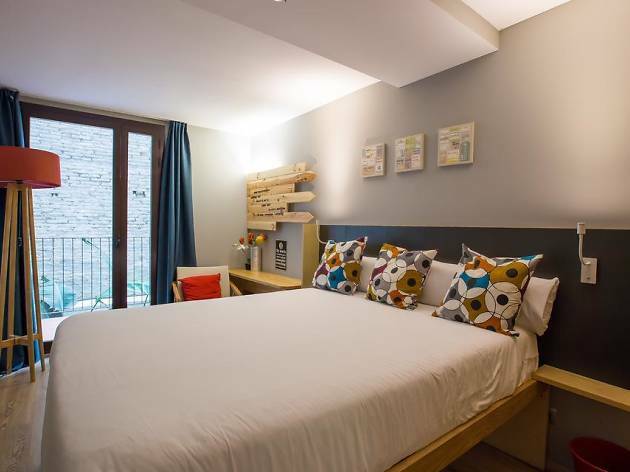 This self-described modern backpackers’ hostel features bright private or shared dorm rooms distributed over five floors. Guests love the individual curtains and accoutrements in the bunk beds, making them into your own little private pod. There's a 24-hour reception, WiFi, a shared garden courtyard and lounge, and a very friendly and helpful staff. Just off Plaça Catalunya, you really can't get more central than this. You're just next door to Belushi's, where you can get discounts on food and drink (and even practise your Spanish if you're up for it!). Ask at reception about renting bicycles and scooters. It's a Travelodge, so you most likely know what you're getting: clean, comfortable, standard lodgings at an affordable price. 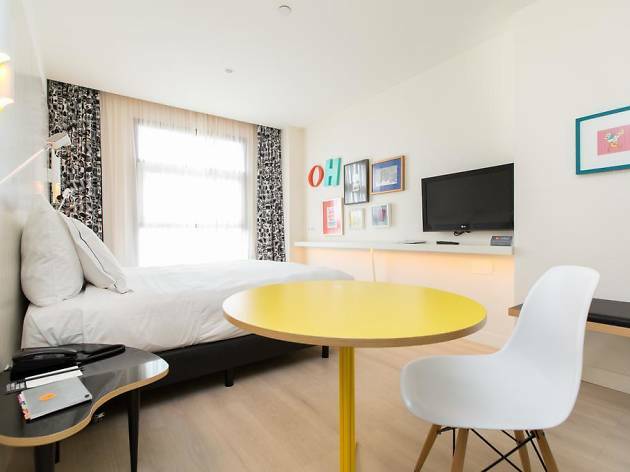 This is a great option for anyone travelling for work, as it's in Barcelona's 22@ district, also known as the city's 'district of innovation', in an up-and-coming part of Poblenou, which is already long known for its creative spirit. If you're coming for fun, though, it's good to know you're also walking distance from the popular Bogatell city beach and the port, and the area is filled with lively restaurants and bars, art workshops, parks and ramblas great for wandering around. You're also just a five-minute walk to the nearest metro station, so getting around Barcelona or getting back when you want to rest is dead easy. 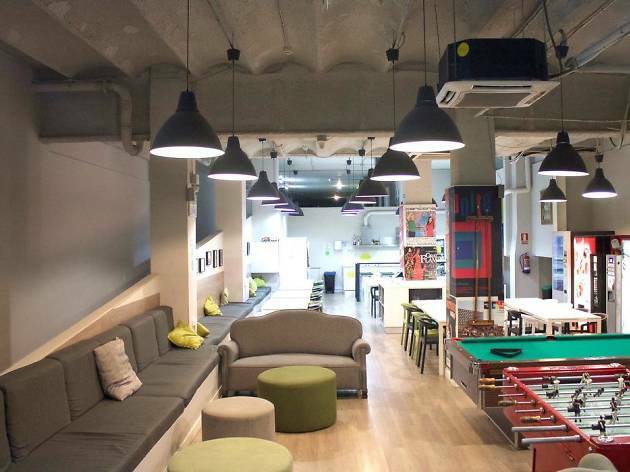 Another youth hostel that welcomes everyone, Hola Hostel is in the Eixample, not far from the Sagrada Familia in one direction, and the hip Born neighbourhood in the other. Though they can pack 'em in like an army barracks (up to 25 bunks in a room), the dorm rooms are surprisingly quiet, comfortable and spacious. Note all rooms are shared, though some do have private bathrooms. Amenities include a sunny terrace, free WiFi, breakfast, kitchen facilities, table football and pool table, bike rental service, and more. The hostel also organises nightly party events if you're up for it.